“Wishing you every happiness this Holiday season and throughout the coming year!” reads our exclusive Holiday card. 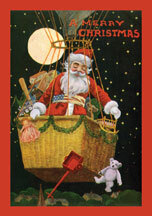 Pack of 15 cards depicting a vintage Santa in his Hot Air Balloon delivering presents. Includes envelopes.